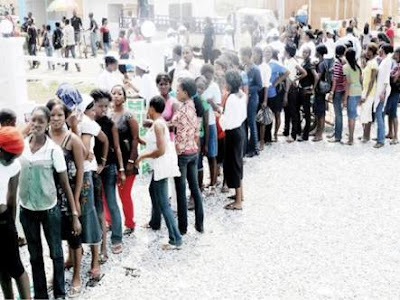 "Nigeria’s unemployment, poverty rates increased in 2017"
Nigeria’s unemployment and underemployment rates increased in 2017, the World Bank has said. A statement issued by the World Bank in Abuja on Monday night showed that this was indicated in its report, ‘Nigeria Bi-annual Economic Update’. According to the report, Nigeria emerged from recession in 2017, but poverty in the country increased slightly. Titled: ‘Connecting to Compete’, the report stated that Nigeria’s Gross Domestic Product growth reached 0.8 per cent, driven by an expansion in oil output and continued steady growth in agriculture. The World Bank said, “The decline in the non-oil, non-agriculture sector, however, continued, as aggregate demand remained weak and private sector credit low. The Global Lead, Territorial Development, World Bank, Somik Lall, said that spatial integration and sub-national specialisation were key to creating a nationally-integrated market for goods and services as well as attracting much-needed private investments, which in turn could enhance productivity through scale and specialisation. According to the World Bank, Nigeria will benefit from policies to promote spatial integration and sub-national specialisation, which will stimulate diversified and long-term growth. This can be achieved through market specialisation and differentiated positioning strategies for industrial clusters across the country, according to the report. The Punch reports that the bank said the key challenge for policymakers at the federal and state levels was to identify interventions (policy, regulatory, institutional and investment, etc.) that were best suited to realise development potential of sub national regions and integrate domestic markets. For Nigeria to tap its spatial drivers of development, policymakers may want to focus on investments that reinforce clusters and economies of scale and optimise the connectivity between rural areas and the major urban markets, the bank said.